Small but Terrible: Tiny Printer Saves Big on Money and Environment | TonerGreen - Eco-Friendly Toners from the U.S.
Fresh off the press, I’m sure people who are using Netbooks and smart phones will be thrilled to read or hear this news. PlanOn Systems Solutions, Inc., one of the world leader in scanning and printing solutions, has recently unveiled the Printstik PS905ME, the world’s tiniest printer. Printstik makes it easier for people who are always on the go to take care of their printing needs. To date, printing documents when you’re out of the office or house or while you’re on vacation is a major concern among businesspeople. Printstik allows a complete portable printing power. It is lightweight and completely mobile. A good plus factor for this is it works on rechargeable batteries so you don’t have to chase the electric socket or power source when you’re in the mall or in the beach. Printstik also utilizes thermal printing technology which means that it prints inkless so you don’t have to worry about running out of ink and toner. When it says Printstik is the smallest and lightest printer in the market, PlanOn is not kidding. Printstik weighs only 1.5 pounds and with dimensions of 2 x 2 x 11 inches. It is small enough to fit into a 15-inch laptop bag or even in your tote bag or deep coat pocket. No worries over possible ink or toner leaks and spills since it use thermal technology to print. However, it only prints in monochrome or black and white. 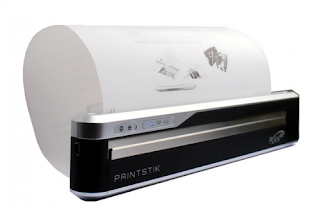 The Printstik can hold one roll of paper or about 20 sheets of regular letter-sized paper. It can readily connect to laptops, netbooks or any other type of computer as well as on smartphones.